← Periodization Paradigms in the 21st Century: Evidence-Led or Tradition-Driven? Intervals all year round…..this should be the norm! It should be said that while interval training was present throughout most of the training year it definitely did not make up the bulk of training in either Seiler’s study or Salazar’s program, or even Zatopek’s for that matter. In fact, across the year, interval training only comprised 15-20% of total training. That said, it was present and emphasized throughout the athletes’ development – for most of the year, every year. At first glance, this may seem to fly in the face of the principle of specificity. Make no mistake, it does! If we take a look at the elite marathoners from the time of Zatopek on, from Buddy Edelen to Shorter to Deek to Salazar to the African champs of today, only a very small amount of training is indicated at actual race pace. Instead, training is focused on the specific training intensities that maximally train a given fiber type. 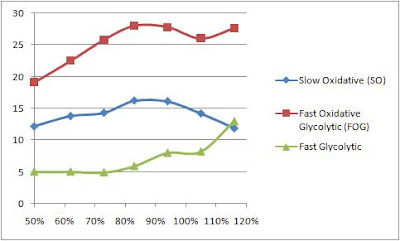 In the figure above (adapted from this study), the x axis represents intensity (%VO2max), the y axis represents aerobic adaptation in the form of cytochrome c concentration (nmole/gm). As you can see, slow twitch fibers were maximally (aerobically) trained at an intensity of ~83% of VO2max (approximately equal to the anaerobic or ‘functional’ threshold. FOG fibers were maximally trained at anywhere from 83-116% of VO2max, while FG fibers weren’t significantly trained until the workload exceeded 100% of VO2max, and weren’t maximally trained until the workload reached 116% of VO2max. An additional study that has particular relevance to the optimal duration/intensity combination for slow twitch fibers was that of Harms and Hickson (1983). In this study, the researchers found a near linear relationship between duration of work and adaptation of slow twitch fibers. In other words, providing a minimal intensity of training was maintained (60%VO2max), doubling training volume elicited performance improvements of 40-100%. When we compare to the improvements in Dudley’s study, it becomes clear that in the case of slow twitch fibers duration and frequency trump intensity. Seiler’s studies along with similar studies on runners by Esteve- Lenao et al. (2003) and cyclists (Lucia et al, 2000) show the majority of training volume to occur at ~60% VO2max, i.e. the mimimal intensity in which ST fibers are significantly trained. This intensity significantly (though not maximally) trains the slow twitch muscle fibers, however, it requires minimal CHO contribution and so can be maintained day after day. In accordance with Harms and Hickson’s study, the ability to perform greater duration and frequency at this intensity trumps any improvement that the athlete would receive by increasing the intensity. Now, the kicker, FG fibers are not trained below the anaerobic threshold and not significantly trained below VO2max. In fact, these fibers were maximally trained at 116% of VO2max! In other words, while you may not ‘need’ your 250W fibers for your current Ironman performance, it is prudent to devote a small amount of training time to keep them around. Who knows? You may need them a few years from now 🙂 Actually, from a truly scientific perspective, a part of the above statement is highly contentious. There is significant debate as to possibility of FT->ST conversion. However, the smart money (such as that of Ed Coyle) falls on that side of the fence. Additionally, the concept has been proven with sufficient stimulation in rats. Overall, I’m leaning towards this possibility. However, even if you’re not willing to concede that ‘truth’ you have to at least recognize the universally accepted notion of FTb->FTa conversion. This is a conversion that you can ‘use’ in your development as an Ironman athlete, a race which does elicit significant energy contribution from FTa or FOG fibers. Actually, one of the key adaptations that we see in muscle biopsies of elite endurance athletes is a near 100% conversion of FTb->FTa fibers. In other words, training these anaerobic fibers to be aerobic is a key objective. Now, the reality is, to train a muscle fiber, first you must recruit it, and as the chart indicates, there is minimal FTb recruitment below the anaerobic threshold. So, some of our training should be done in excess of the anaerobic or functional threshold. Now, this doesn’t mean that you need to line up along side Maurice Green for a series of track repeats. In fact, the recruitment of FG fibers is much more dependent on load than speed. But whatever modality you choose (strength work, short hill repeats, big gear power intervals on the bike, tethered swimming), if you want to aerobically train all fiber types a small portion of your energy during your week should be devoted to exercises performed at a high work load. This is at least as (if not more) important than training at moderate intensities (mod-hard to threshold). Fast twitch training isn’t without it’s problems, however, namely great glycogen depletion and muscle acidity that can damage muscle and exacerbate recovery requirements. There are, however, some tricks that we can play with the interval duration and recovery that can significantly mitigate these negative effects and make speed work much ‘safer’. These tricks were discovered many many years ago by Hans Reindell and Woldemar Gerschler and used to great effect by such athletes as the great Emil Zatopek. Recently, these tricks have been confirmed experimentally by folks such as Tabata (1997), Stepto (1998), Hawley and Noakes (1997) and Billat (1999). 1. Use short intervals (ONLY) during the base period. Essen (1978) found that providing the length of the training interval was kept short (15-30s), exercise performed in excess of VO2max elicited glycogen depletion patterns and lactate levels much more in accordance with tempo or threshold training, i.e. 2-4mmol/L lactate even when continued for 30-60 minutes (i.e. 30-60 repetitions). These intervals do not provide the same level of stress on the central systems as long intervals, therefore long intervals or time trials are indicated for a short period of time prior to competition to truly peak an athlete, however, in terms of maximizing peripheral adaptations in FG fibers, 30-60 reps of 15-30s with a 15s-1min rest period is optimal. Brooks (1978) found that lactate removal is facilitated almost two-fold by utilizing active recovery between bouts. Additionally, Billat (1999) found increased ability to remove lactate in athletes who followed a short interval training program with active recovery vs. one with passive recovery. 3. Only perform as many repetitions as you can while holding appropriate quality. Gerschler’s rule of thumb was the intervals should only be continued until the HR fails to drop to 120bpm within a given recovery period (30-90s dependent on the length of the interval) while target pace is held constant. While the 120bpm figure may be arbitrary, the concept that decreased recovery heart rate reflects greater anaerobic contribution is solid. For shorter intervals, one could argue that the recovery HR is a better indicator due to CV lag time. Either way, when either power/pace drops, or working or recovery HR significantly changes for a given power/pace output, it is time to shut it down. Hopefully, this post has illuminated the relevance of speed and strength training for endurance athletes. While we do not have the same objectives for our FTb fibers as speed and strength athletes, we still need them! By doing your bit to keep these fibers alive and kicking throughout your athletic development, they will be ready and waiting when you need them the most as you approach the Zenith of your personal athletic potential. This entry was posted in Reviews, Training and tagged Cycling Endurance exercise engineering Fatigue Profiling Heart Rate Monthly Testing Protocol Orthostatic Heart Rates Power sports and exercise engineering sports engineering Sports Exercise Engineerin, Fatigue Profiling, Intervals, Sports Exercise Engineering, Training, winter program. Bookmark the permalink.